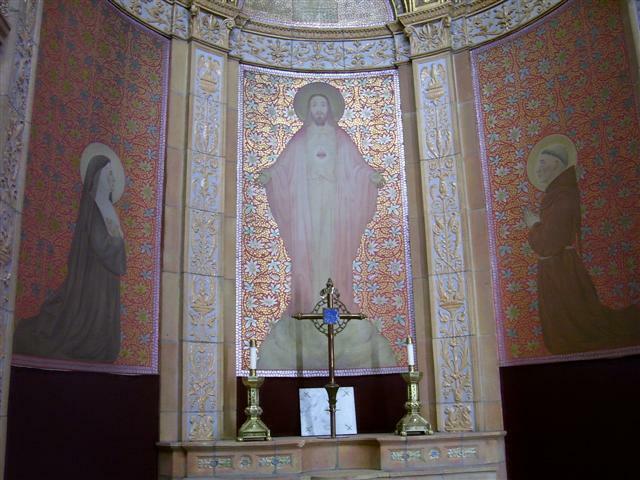 St. Bonaventure (1221-1274) is depicted on the right in this mural at Blessed Trinity’s side altar devoted to the Sacred Heart. The Saint is associated with devotion to the Sacred Heart, which “arose out of reverence for the Pierced Side of Christ and medieval devotion to the Five Wounds and the Heart of Jesus.” (Rev. Walter Kern’s Guidebook to Blessed Trinity Roman Catholic Church, page 28). Thursday, July 18 ~ at 8:00 p.m ~ Bingo will be played in St. Charles Hall. Saturday, July 20 at 8:00 p.m ~ Bingo will be played in St. Charles Hall. Monday, July 15 ~ St. Bonaventure ~ Communion Service at 11 a.m.
Project Homeless Connect ~ As a way of showing homeless people and families that the community is aware of and cares for them, we are collecting deodorants for the Personal Items Bags that they will receive on September 5 at the 5th Annual Project Homeless Connect Day at the Buffalo Niagara Convention Center. Baskets for your donations are at each end of the altar railing and will remain there during the month of July. We thank Sister Claire Edwards, Daughter of Charity from Sisters Hospital, and our Parish Council for bringing this worthwhile project to our attention, and we thank you for your generous cooperation!!! Annulment Workshop – If you’d like to apply for an annulment but don’t know where to start, plan to attend the Annulment Workshop on Tuesday, July 16, from 6:30 p.m. to 9 p.m. in the UB Newman Center, 495 Skinnersville Road (the traffic light just past Sweet Home High School) in Amherst. To register, call Barbara Wyse at 716-633-7786. Annual Men’s Retreat at the Columban Center in Derby, NY will be September 6-8. The theme is “Religion vs Faith.” Open to all men, it begins with registration at 4 p.m. on Friday and ends with Mass and Brunch on Sunday. For more information or reservations, contact Rev. Paul P. Sabo at (716) 604-4948 or the Holy Name Office at (716) 847-2201. Reservations are limited to 55 men.